Project 2737: S. Hand,R. Beck,M. Archer,N. B. Simmons,G. F. Gunnell,R. P. Scofield,A. J. D. Tennyson,V. L. De Pietri,S. Salisbury,T. Worthy. 2018. 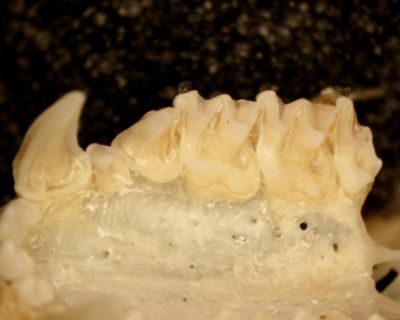 A new, large-bodied omnivorous bat (Noctilionoidea: Mystacinidae) reveals lost morphological and ecological diversity since the Miocene in New Zealand. Scientific Reports. 8:235. Slight oblique occlusal view of left upper tooth row. This media file was first entered in MorphoBank as M23719 in P220. It has also been used in: P891 as M173525.